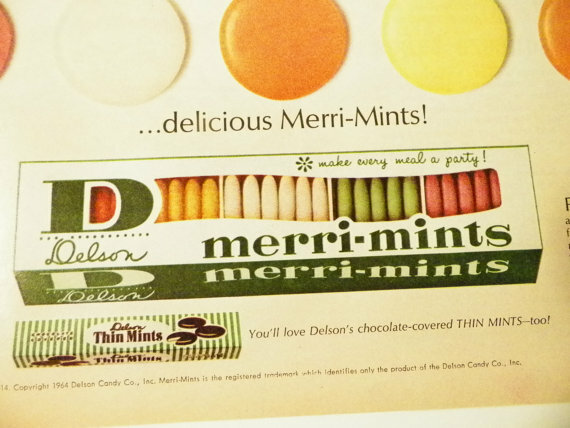 As a child, my mother used to purchase boxes of Delson’s Merrimints for bridge and dinner parties. I wasn’t allowed to eat them, since they were for company, but I knew how to get to the high shelf in the butler’s pantry where the sweet forbidden treats were kept and ate them anyway, much to my mother’s annoyance. 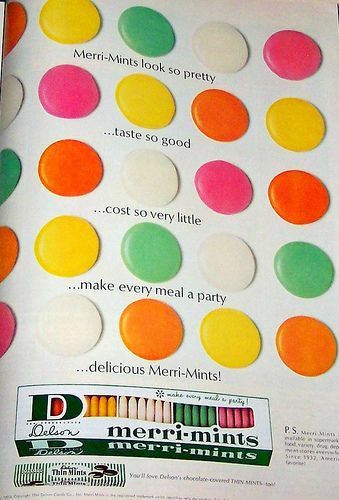 The original Merrimints came in boxes with a cellophane window, and included orange, lemon, wintergreen (pink), peppermint (white) and spearmint (green) mints. They were shaped like discs with ridges on the underside and had a unique and wonderful consistency. If you’ve ever eaten maple sugar candies, they had almost the exact same texture: a thin crystallized surface but they would melt in your mouth like butter, becoming immediately almost liquid. They tasted like heaven. They were about the size of silver dollars, perhaps a bit bigger. A magazine ad from the 1960s or 1970s. People haven’t forgotten Merrimints though, and people all over the Internet who remember them lament their demise. Several small candymakers, responding to the continued demand for these crystal-to-creamy confections, have attempted to recreate their own “Merrimints,” and they do taste almost exactly like the originals. Oliver’s Candies has made their own version, very true to the original, but are missing the orange mint flavor (apparently this was the least popular flavor, but it was actually my favorite). 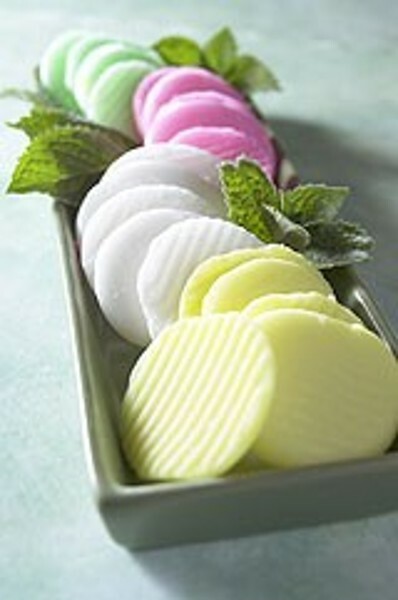 The Vermont Country Store (almost everyone probably gets their catalogue during the holidays) also offers their own version, “Pastel Mints.” These are also missing the orange mint flavor, but I have tasted them and they are exactly like the originals, although they may be a tiny bit smaller. The Vermont Country Store also offers red Pastel Mints in cinnamon. I haven’t tried these, but they sound intriguing so I may order some. There is even a photo in which you can scroll your mouse over it to zoom in for a closeup. Unfortunately I’m not able to copy the photo here. I did find one recipe for Merrimints-like wafers. I haven’t tried it, so I have no idea how true to the originals they taste, but I’ll go ahead and reprint it here, in case any nostalgia candy buffs want to try to make them. This entry was posted in candy, candy from the past, Merrimints, mints, nostalgia, nostalgic candy, Oliver's Candies, recipes, Vermont Country Store and tagged American food, candy, candy from the past, Merrimints, mints, nostalgia, nostalgic candy, Oliver's Candies, recipes, Vermont Country Store by luckyotter. Bookmark the permalink. I don’t think I have ever seen them before, but I am curious now! I just ordered 2 boxes! I wish they’d put in the regular assortment because the originals had orange…in their latest catalogue I don’t even see the orange offered anywhere…just raspberry. No, no no! I got mine from the Vermont Country Store. You can find them online or order from their catalog. For some reason they don’t include the original orange mints, but they are ridged and they taste exactly like the originals! I don’t think you can shop online. I would suggest calling and see if they can ship out to you. A great resource! !